Well, I had to, hadn't I ?! 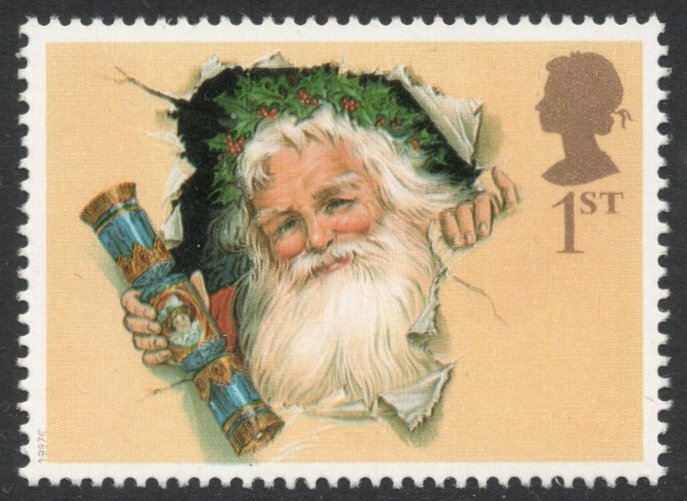 It's nearly Christmas, so what better way to prepare for the festive days than to think about which Christmas stamps I like best! Which is no easy task because basically I'm not that fond of Christmas stamps at all. To put it mildly. But I have a few favourites, so I'll show these. They all happen to be British, but that is basically because I wouldn't normally buy any, so the ones I'm showing are just part of my general GB collection. I actually had this on number two to begin with, but seeing it again after having been tucked away in a stockbook for so long (the stamp, not me), I do find it's a bit American (no offense! ), so it dropped a place. Probably also because I don't like the other stamps in the set, it's just this one that has made such an impact. But I like it very much and when it was issued, in 1997, I absolutely loved it and used it constantly, even though it was a first rather than second class stamp. Very Christmassy and I like the design idea of Father Christmas crushing out from out of the background. So: well done, J. Gorham and M. Thomas! Ah yes, this must be a favourite of many. 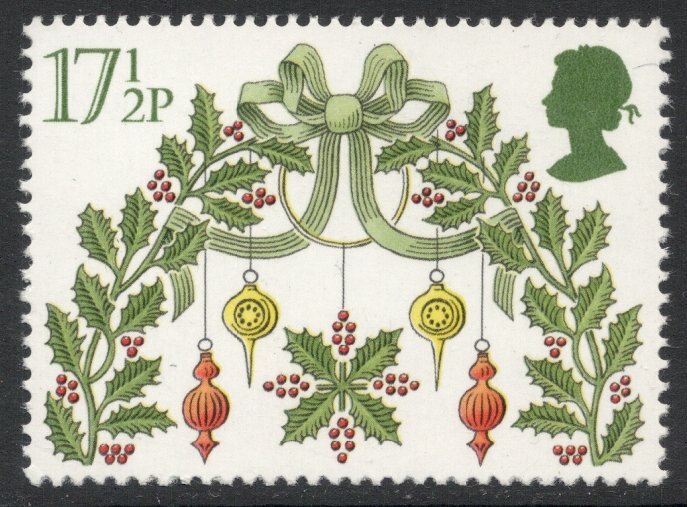 The symmetrical Christmas stamps designed by Jeffery Matthews of Machin fame. Brilliant, clean, and festive designs, all five of them. They were issued in 1980. Needless to say I never used them for my Christmas mail, but would have loved doing so! Yes, yes, yes, I still love it, every time I see it. Wish this one would be reissued every year! It's so beautiful and by far the best of the set, although I like the others too. The design is by Irene von Treskow and the stamp was issued in 1998. It hasn't been surpassed by any other Christmas stamp yet, and I dare say that might take some doing! Well, there's always one who doesn't make it into the top three, yet deserves to be mentioned, I suppose. 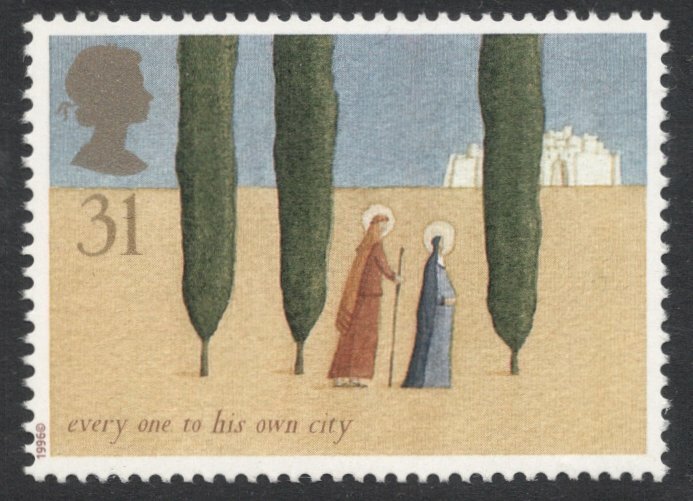 I've included this 1996 stamp because I think the whole set was very original and beautifully designed (by Laura Stoddart). It's not an easy design, so I'm not sure whether it's very effective or successful as a Christmas stamp, but study the designs of all five values more closely and you'll see how refined and lovely they are. So let's give this set the honour of "Most Sophisticated Christmas Stamps"! Leaves me to wish you a very good one, and you know the procedure by now: why not tell me which Christmas stamps you like best (not just GB, mind! ), either here or on this forum thread. Wouldn't life be dull if we were all the same? I've just had a flick through the catalogue, and apart from your number 1, my views are totally different! 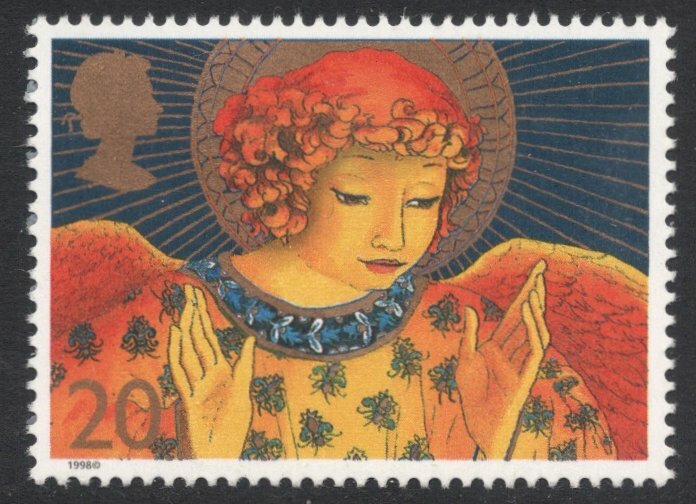 Why use buff on a Christmas stamp?! (No 3 and hon. mention). And, bizarrely, while I see WHY people like no2, and I think Matthews is a stunning stamp designer, that set has always seemed a bit dated to my born-in-1978 eyes. I think mine are: no3, 1981 11 1/2p. I don't normally like Child Art, but this one's just so happy, and Father Christmas looks so jolly. No2, 2009 2nd class. I like stained glass window stamps, and this issue seems the most successful and cleanest of the several RM has done. The 2nd class is also the only one not to have a huge black line of lead across the middle! And my no1 is the same as yours. It can't be beat! Adrian, good to see you writing here. any chance of you adding mine to your list of blogs please. Michael, consider it done! Looking forward to being included on your blogrolls. Great to have you here. And a Merry Christmas to you too!